Securatape is available for despatch within 2 working days, Normally sold in boxes of 20 rolls, here we offer two versions in smaller quantities, even single rolls! Roll size is 50 metres long x 48-50mm wide on a standard 76mm core. It is suitable for sealing carboard boxes, cartons, jiffy bags, envelopes and even plastic bags. Not suitable for re-usable items. Blue tamper evident security tape 50 metres x 50mm with overt printed 'security' message and high visibility void message revealed when tape is removed. Perforated every 152.4mm to provide over 320 optional tear off security seals. Priced @ £18.00 per roll excl VAT. 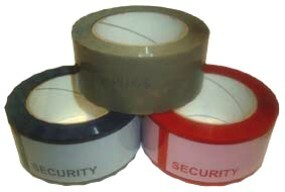 Plain Brown tamper evident security tape 50 metres x 48mm with void/open message revealed when tape is removed. Priced @ £16.00 per roll excl VAT. Need bulk buy discounts for this product ? Buy by the box or contact us now.